If you’re one who tends to copy others, then I think it is safe to say that you succumb yourself to the label copycat. This terminology usually falls under the umbrella of lack of creativity, the inability to think for oneself, and often can lead to disputes. In retrospect the argument against being a blatant copycat is admiration of others work, making choosing to copy a compliment. In the world of design and branding, where the usual rule of differentiation is best applied, copycats are capitalising. Un-shy about their duplication and unhinged similarities to competitor brands, is this infringement, or is it complimentary? My question quite simply is where is the line drawn? Supermarket giant Aldi is one offender that seams to be sticking its heads firmly on the line. 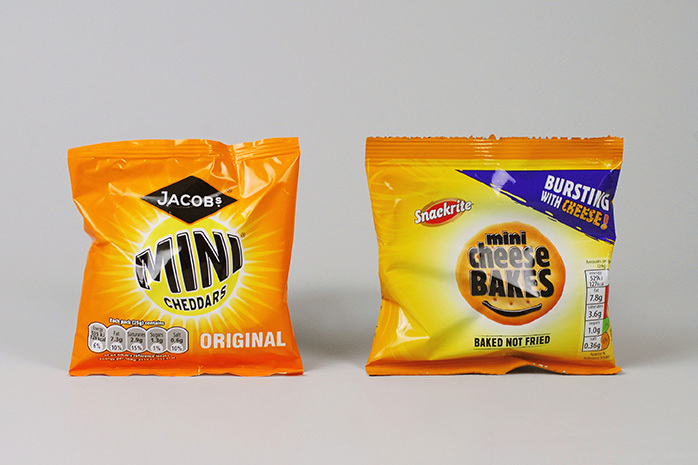 Having inspected a pack of Aldi’s mini cheese bakes, it dawned on me how remarkably similar the packaging was to Jacobs baked mini cheddars that I could have easily mistook it. 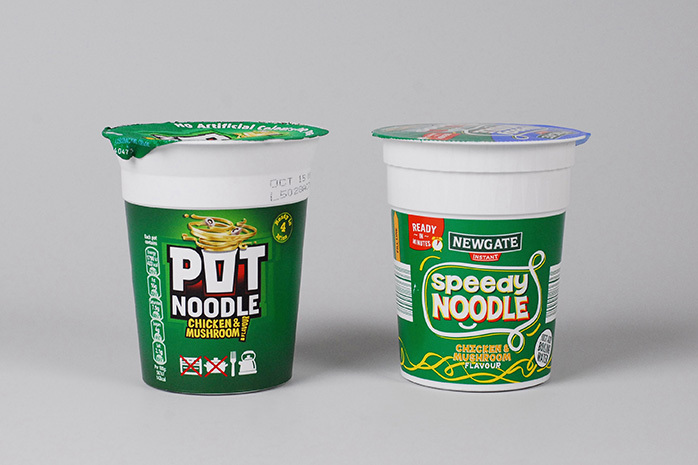 Both support visuals that imitate that of a sun shining with an orange hue surrounding the outer edges of the packet. 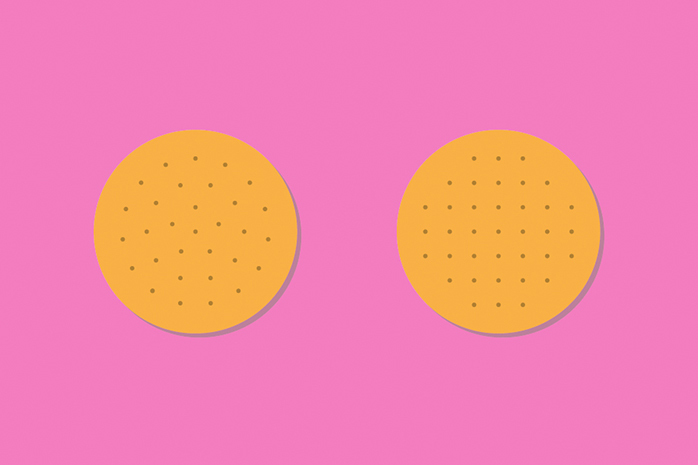 In the centre is a circular disk designed to replicate the snack within. The title is centered over the image, and both include almost identical tag lines – Aldi baked not fried, and Jacobs oven baked not fried. This is surely a purposeful choice. Upon noticing this particular item I delved a little further into Aldi’s supplement options, only to discover mini cheese bakes were one of many items Aldi seemed to be mimicking. Radox Shampoo, Lurpack Spreadable, Coco Pops, and Carte D’or are just a handful of brands that have been robbed of their packaging design. Why Copy? There has to be a reason, and there is. Consumers become accustom to products and form a subconscious attachment to what brands are their favorites, and the ones they trust to be good. For me I will always buy John Frieda shampoo, Colgate toothpaste, and I am currently obsessed by Ryvita Thins. No matter the price I will pick these brands, and I wont choose to experiment. The reason being, I do not want to pay for something and get home only to discover it is not as good, I’ve never tried any other toothpaste and believe I wont like it, I trust John Frieda to be one of the best brands going when it comes to the care of your hair, and I am happy with my decision. So how do competitors break the cycle and get us to quit our habitual shopping? “If you can’t beat them, join them” could not be more true in this instance. In the words of Andy Warhol “It’s not what you are that counts, it’s what they think you are”. 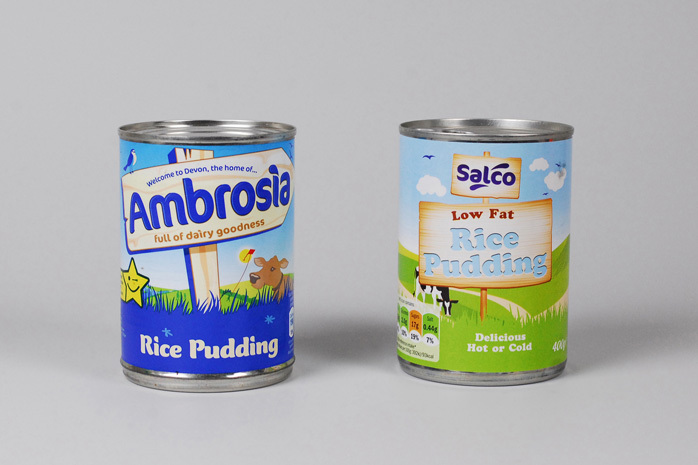 Supermarkets are cashing in on consumers accidentally mistaking their product for the real McCoy. Choosing to replicate reputable brands is no longer the work of a copycat, but a genius. Once the penny had dropped spotting our mistaken purchase, payment has already been taken, and so the inevitable oh it will do attitude comes into play. It is at this point that some, and many do realise that the mistaken item is actually just as good and cheaper to buy. Consumers are now presented with a win win situation. Aldi have tricked us and conquered. As a consumer we might ultimately be left happy, but what about John Frieda and Colgate, how are they feeling? Not too happy I would imagine. As a design agency we too have come across our own copycats in the past, and we are often rather unsure of what to make of it. Designing luxury magazine ‘Hot’ for a local client; upon publishing a few weeks later we came across a publication that replicated our editorial feature (in their own words of course), layout and page design. Matching our layout we pondered if this too was the work of a copycat or that of a time-saving, good idea spotting genius. Design is creative and unique, or so I thought. With my own chain of unanswered questions, I ponder in the world of design to what extent does copying becoming thieving. As the great Pablo Picasso once said, ‘Good artists copy, great artists steal’.